Mira Gulati, principal designer and founder of Mirari Jewels, in her own words, presents “a fusion of western simplicity with eastern substance…” in her personal attire which epitomises understated luxe. 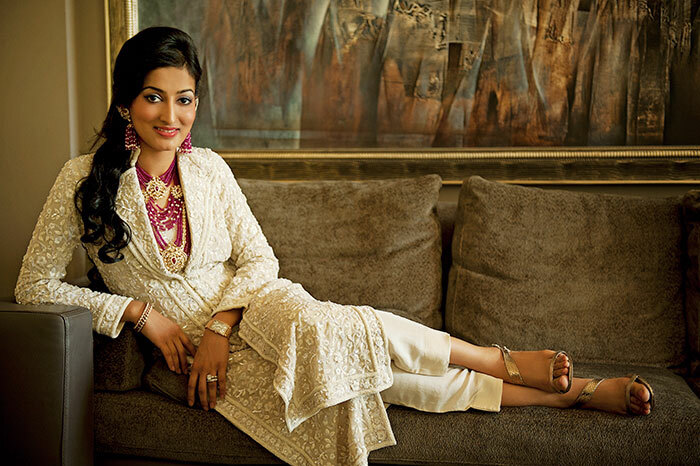 Her style has been described as ‘Indian romanticism meets Chanel chic’. A similar East-meets-West feel is evident in her jewellery designs – replete with dazzling diamonds, emeralds and rubies – which draw inspiration from a resplendent peacock or gossamer butterfly and then move, in luxurious manner, into the sphere of ‘Indian contemporary’. 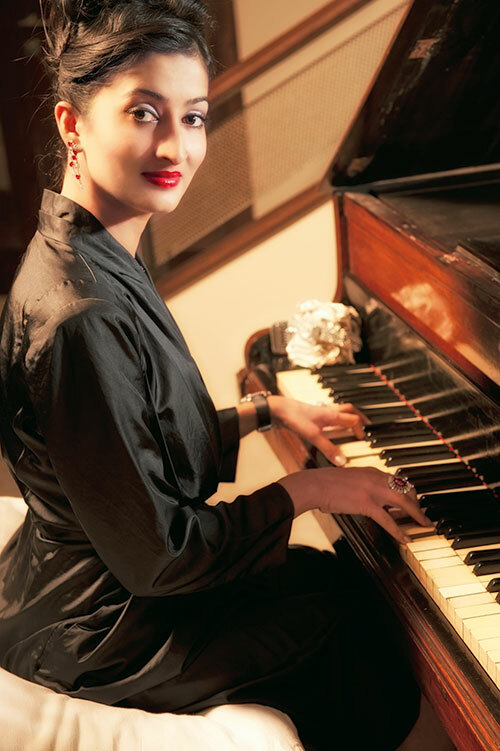 Trained for five years in the US at the Gemological Institute of America, as a jewellery designer and gemologist, Gulati claims that her work “is all about this country’s contemporary attitude towards design”. Ecru silk suit, from CK by Calvin Klein; heels, from Jimmy Choo; watch, from Audemars Piguet; diamond and brown sapphire ear-studs, from Mirari. All from Mira’s personal collection. Jacket, by Ermanno Scervino; trousers, by Alexander McQueen; heels, from Prada; pink Galuchat cuff with diamonds and rubies, and diamond ring, both from Mirari. All from Mira’s personal collection. Draped wrap top, from CK by Calvin Klein; diamond and ruby necklace and earrings, both from Mirari. All from Mira’s personal collection. Cream chikankari suit, by Abu Jani Sandeep Khosla; strappy heels, from Jimmy Choo; watch, from Franck Muller; ruby and polkhi necklace and earrings, diamond and ruby bangles and diamond rings, all from Mirari. All from Mira’s personal collection. Dress, by Alexander McQueen; diamond and pearl feather earrings, and diamond and sapphire bracelet, both from Mirari. All from Mira’s personal collection.